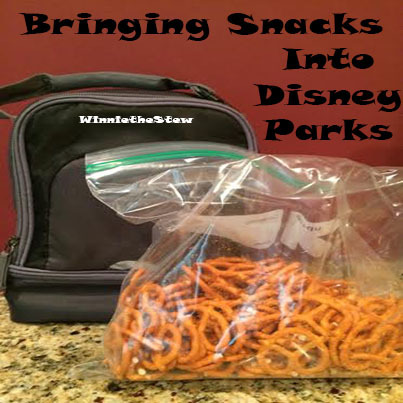 Can I Take Snacks Into The Disney Parks? Disney allows guests to bring in snacks, meals and beverages into the parks and this option can be helpful to the wallet. Even if you are taking advantage of the Disney Dining Plan, you may still want to consider taking snacks into the parks for when those hunger pains hit between meals. The rules of the park state that you must be able to carry your bags; so no coolers with wheels are permitted. Guests who bring in their lunches may wish to rent a locker for the day so they don’t have to carry it around the park. Lockers are available inside the parks for a fee of $9-$12. You will have unlimited use of your locker for that day, and can come back as often as you wish. There is a $5 deposit required for the locker key that will be refunded once your key is returned. What should you bring into the park? Do you have items that you want to keep cool? Bring along a cooler bag. They are easy to carry and many fold easily for travel. If you have a fridge in your hotel room, freeze some water bottles overnight and use them as your ice packs. Once you have enjoyed your lunch, you then have some water to enjoy for the rest of your day. A family of 4 could easily pay $12 or more for one round of soft drinks or other beverages in the parks, so you may want to consider bringing your own. Be sure that any milk products or perishable juices are appropriately cooled with ice packs or those frozen water bottles…..because it gets hot pretty quickly in those parks. Snacks that cannot melt in the heat are your best choice for a Disney Day. Goldfish crackers, pretzels, cereal and popcorn are just some of my suggestions. If a member of your party has a food allergy, bring some snacks along that they can eat. While Disney has some incredible options for all types of dietary requirements, the items may be on the other side of the park when you are ready to grab a quick bite and run to a ride. When bringing lunch into the park, make it a simple meal. Peanut butter and jelly sandwiches are easy and can be prepared quickly in the morning. If you do not wish to make your own lunch, you could visit the quick service restaurant at your Disney resort hotel, pick up a few sandwiches, salads or snacks and put them in the cooler for later. Bringing in your own food and drinks can be a significant money saver. During our last trip, my husband and I brought our own water and soda into each park and saved about $60 for the week…..money that was used for souvenirs at the end of our visit! Money saving while in the most magical place is always a welcome treat!